Joy Creek Photo Archive (c) all rights reserved We do not have much information about the development of this fuchsia. 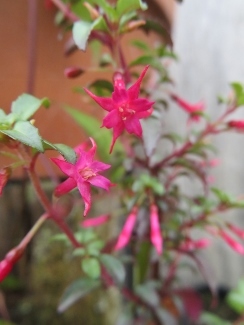 Fuchsia microphylla 'Steel 'n Stars' was apparently collected in the mountains of Central America. Its very small holly-like leaves have a silvery blue metallic cast. The flowers are equally small. The stars referred to in the name are the shape that the sepals form at the ends of their tubes. We suspect that this will have to be protected in Northwest Gardens like the other selections out of Fuchsia microphylla. We thank Alex Wright for providing us with cutting wood. Summer to frost. 4 ft. x 3 ft.